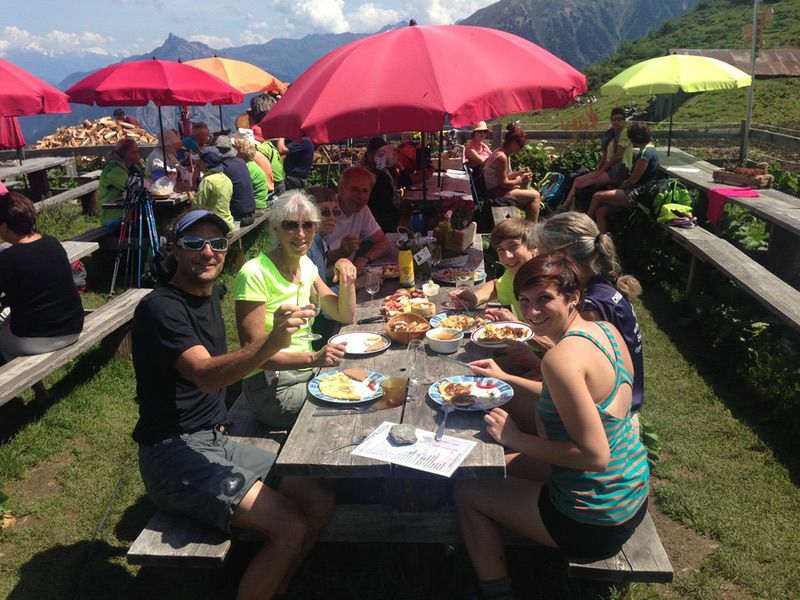 Walking the Clouds: France, Switzerland to Italy! Craving adventure? 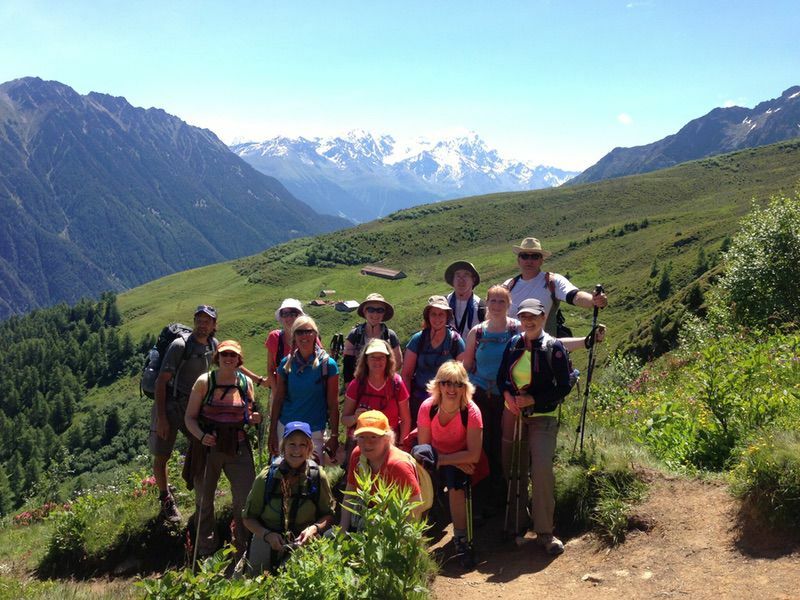 Then come join AFS for some thrilling vacation therapy on an expedition like no other. 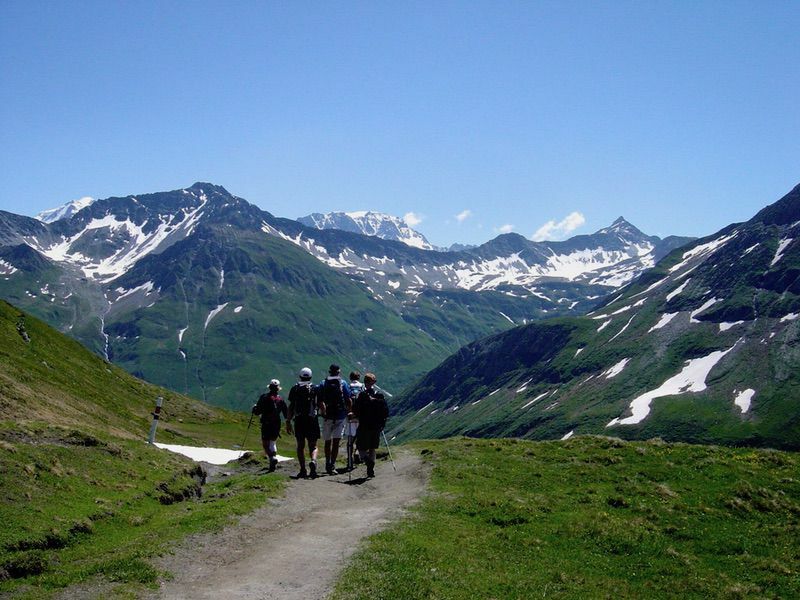 We will follow a variety of alpine trails along the alps with jaw-dropping scenic beauty through 3 different countries! 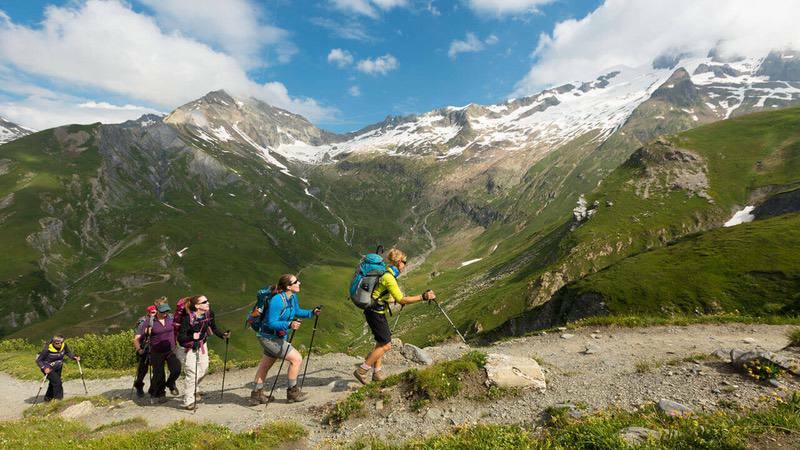 These world-class hiking trails draw 500,000 people each year. 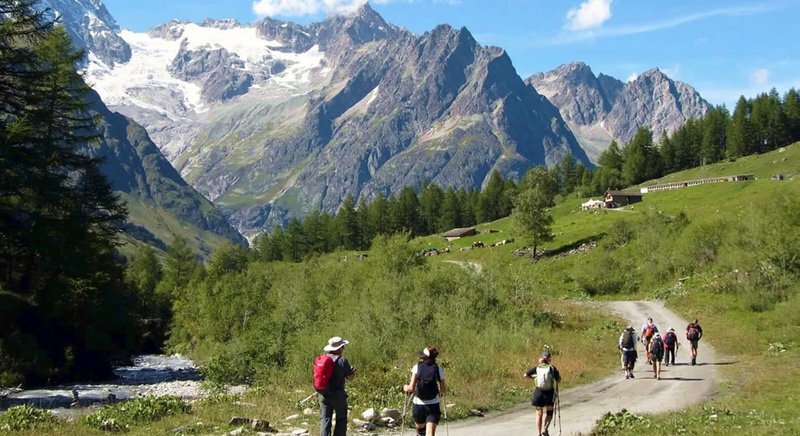 Fodor’s calls it “the world’s best hike.” From our base in charming Chamonix, we’ve combined the best day hikes possible for you. These alps are called “The Ceiling of Europe.” Marvel at glistening glaciers, chiseled peaks, crystal lakes and lush verdant valleys. Late June is the prime time to do this circuit with fewer crowds, perfect weather and alpine meadows that bloom with wildflowers. We walk by day and then enjoy relaxing evenings in quaint alpine villages. I decided to do this right by customizing this into a most pleasurable experience. This isn’t a backpackers slum-it-trip with 40-bed dorms. 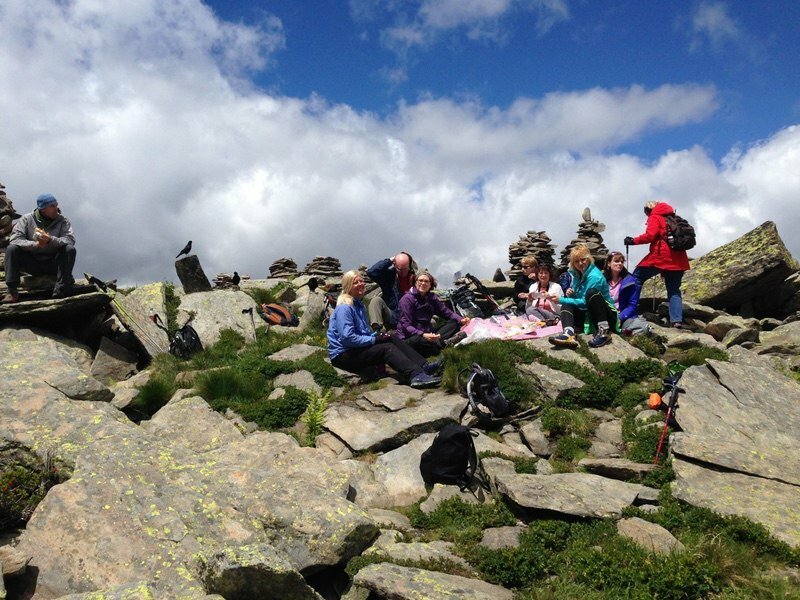 We’ll stay in cozy 3-star hotels called “mountain inns.” We added fresh picnic lunches and hired the top licensed guides to lead you. They divide us into 3 groups according to fitness. Your luggage will follow in vans and most important, we’ll do our major ascents by cable cars and chairlifts! 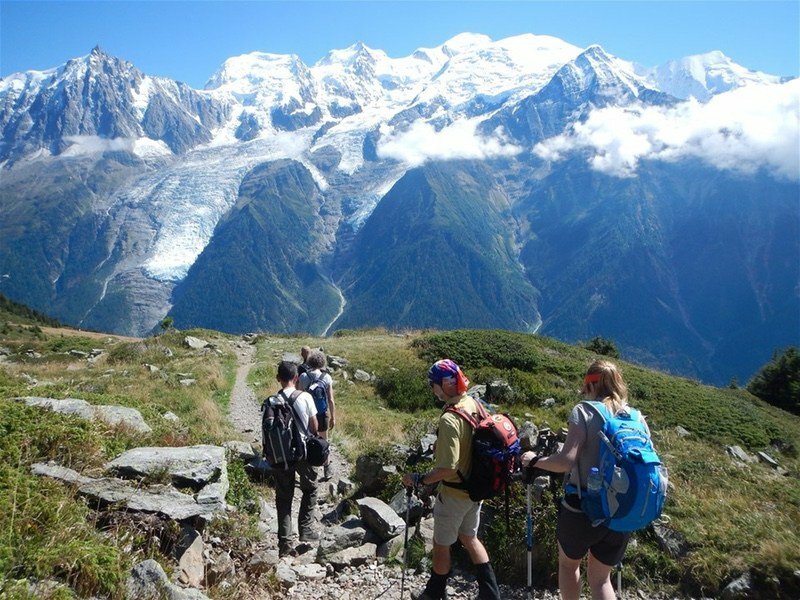 Imagine telling your friends you hiked the famous Tour du Mont Blanc, an experience that has long been on my bucket list. 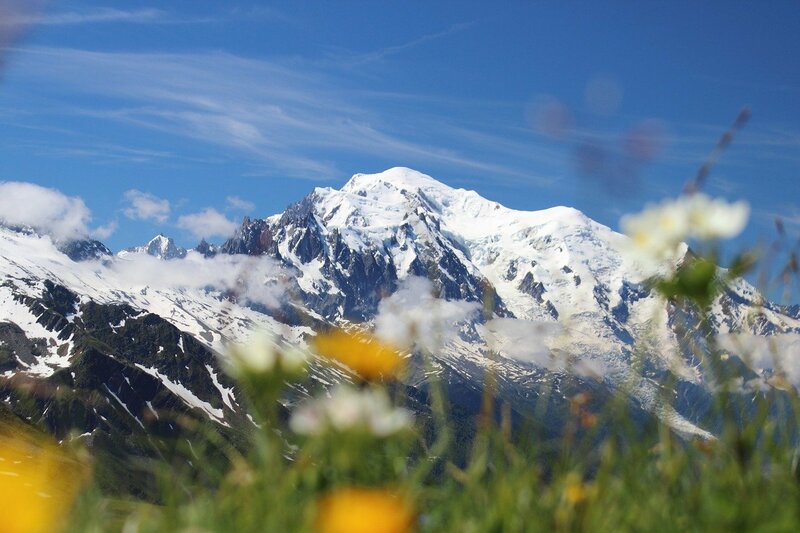 Mont Blanc crowns the alps and is a mecca for mountain lovers around the world. The massif commands respect. The first few days are easy, but be prepared for some challenges later. One must be relatively fit for this active vacation. No special equipment necessary. 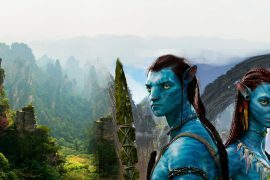 You just need a spirit of determination and adventure. We must limit this to only 24 participants, so it will fill quickly. Since you’re in the heart of Europe, it’s easy to add an extension to any surrounding country on own. 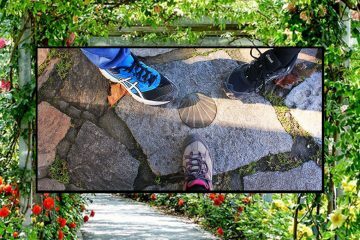 Bring out your inner explorer for a walk above the clouds. With picture postcard vistas from every vantage point, you can’t get more intimate with nature than this. It’s truly an AFS unforgettable journey. 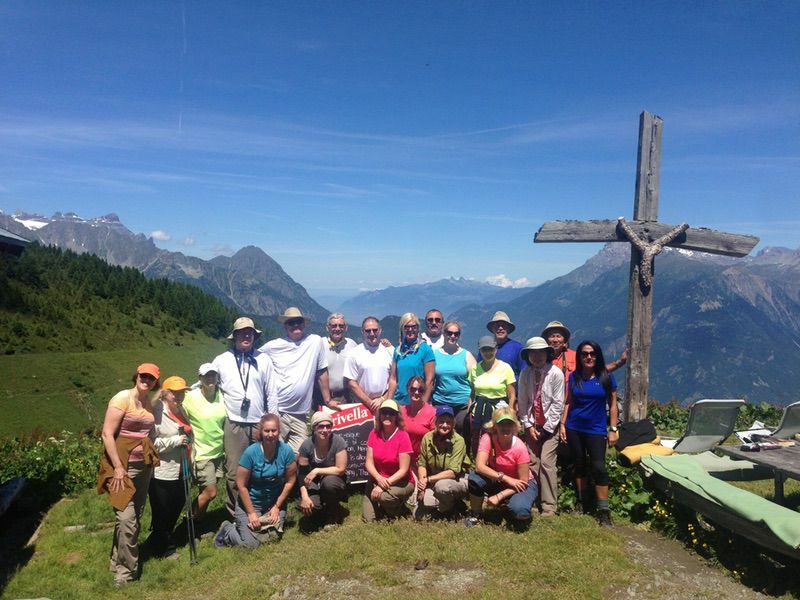 June 30 – Depart USA for Geneva Switzerland. Or you may want to go early to explore Geneva on own or stopover in another European city. Arrangements on own in Geneva. July 2 – We are met at the airport and taken to Chamonix by van and our trip officially begins. Details in Trip Tips will be emailed to you. 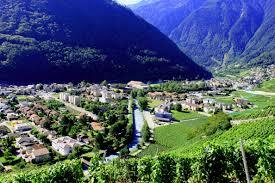 Chamonix (France) is reached in about one hour from Geneva airport (Switzerland). 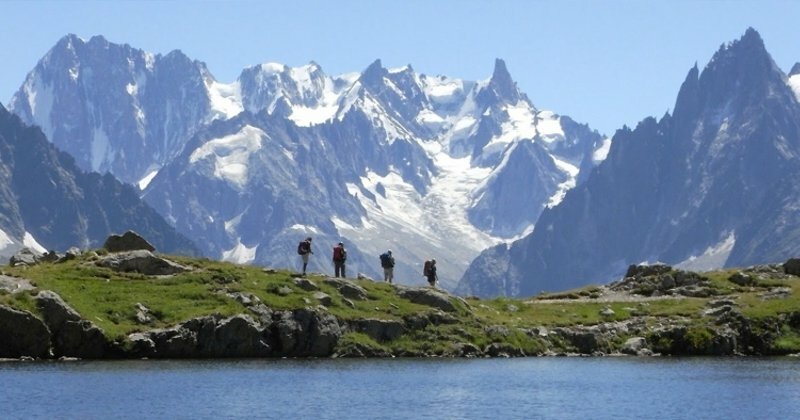 AFS members will be met in Geneva airport and taken collectively to the hotel in Chamonix. After check-in at the hotel in Chamonix, we will hold a brieﬁng on the week ahead. 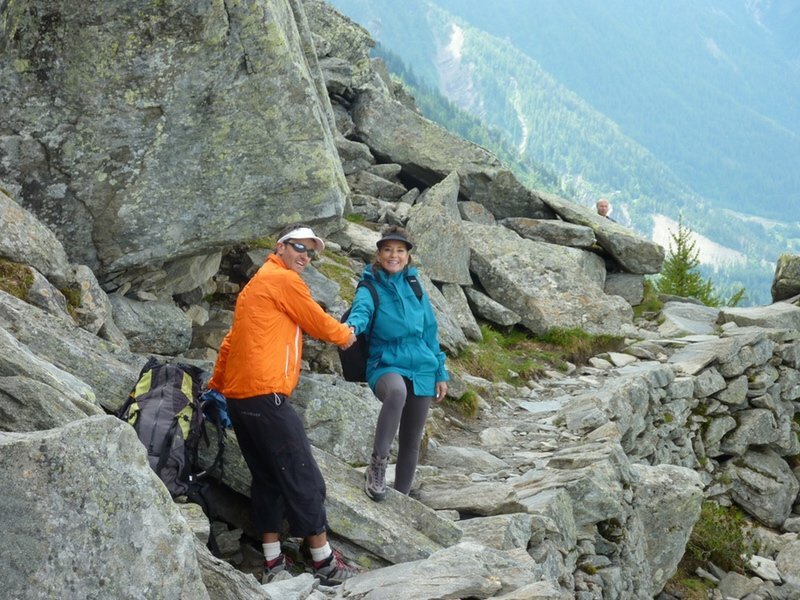 We will then do a short, optional orientation walk around Chamonix town center. 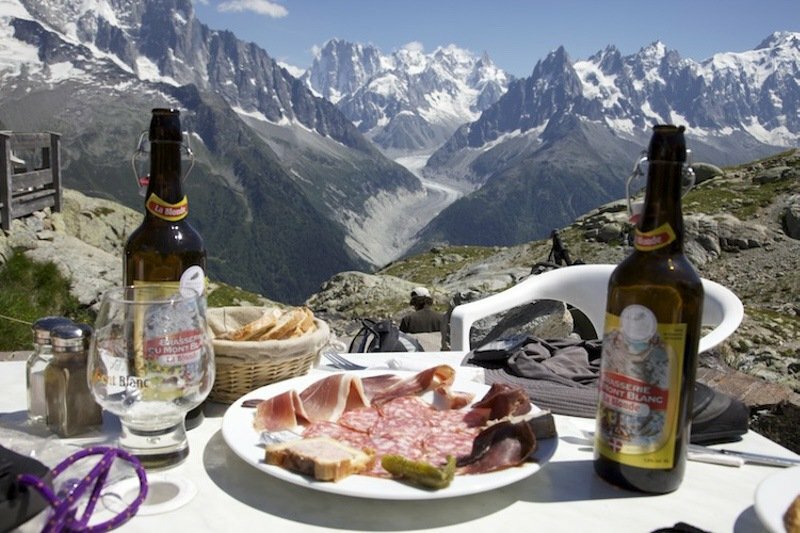 At night, members are free to explore the many bars and restaurants that Chamonix has to offer. 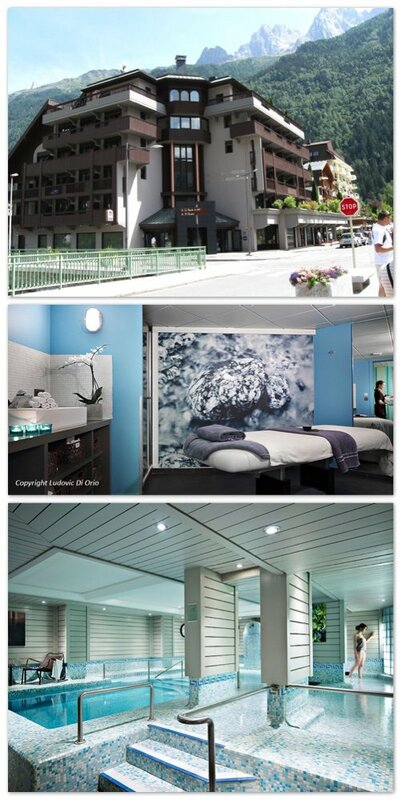 Overnight: Boutique Hôtel Le Morgane in the center of Chamonix for 4 nights. We take a cable car from the center of Chamonix. The cable car takes us to 2000 meters, saving us a long walk. 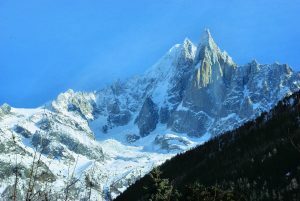 From the top of the cable car, we traverse high above the Chamonix valley and below the majestic peaks of the Mont Blanc massif known as the ‘Chamonix Aiguilles’ (the ’Chamonix Needles’). We arrive at a view-point pitched above the massive glacier known as the ‘Mer de Glace’ (‘the Sea of Ice’). The views here are simply astonishing so it is not surprising that a grand hotel was built here for the early tourists in the Victorian time. A small cable car allows us to descend to the glacier and visit an ice cave that has been dug into the glacier. We descend to Chamonix with the more than 100 years old mountain train. Hiking details: approximately 6 km’s with 350 meters ascent. Hiking time: approximately 4 hours. 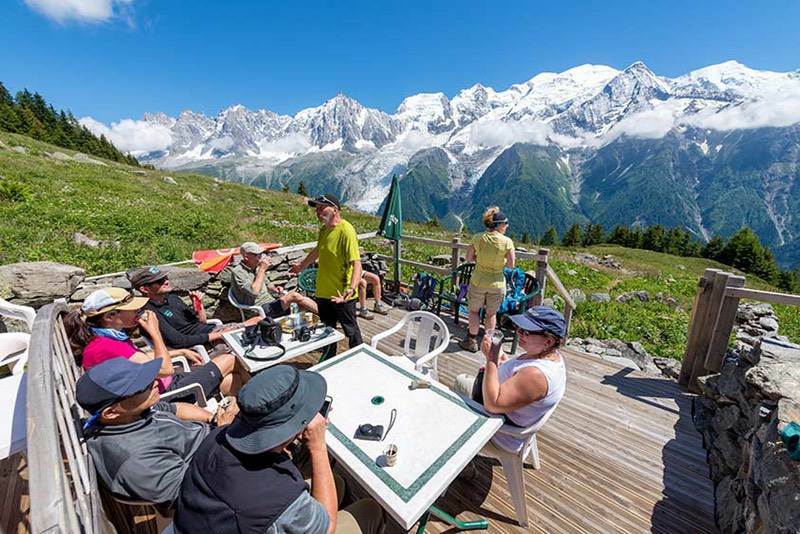 At night, members are free to explore the many bars and restaurants that Chamonix has to offer. !has to offer. At night, members are free to explore the many bars and restaurants that Chamonix has to offer. 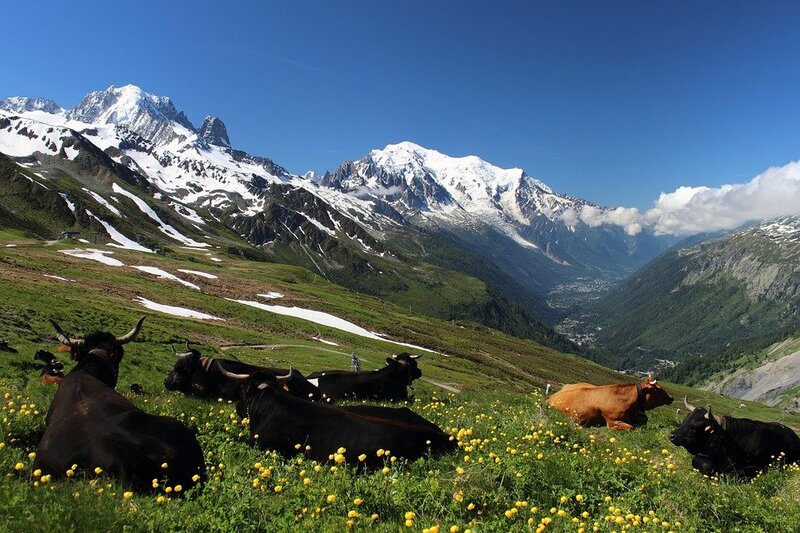 Today, we take a short transfer to the hamlet of Les Praz on the outskirts of Chamonix. Here, a cable car whizzes us up to nearly 2000 meters. 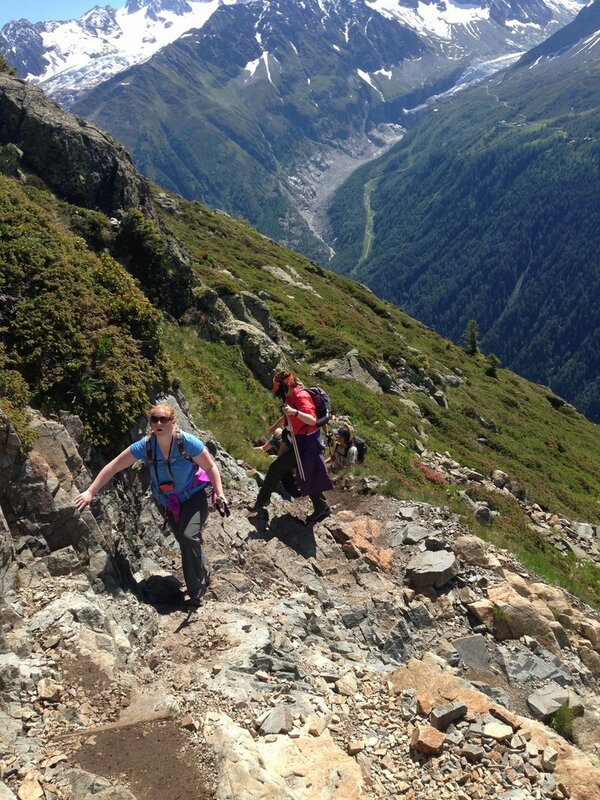 We hike on interesting alpine terrain on the sunny side of the Chamonix valley. 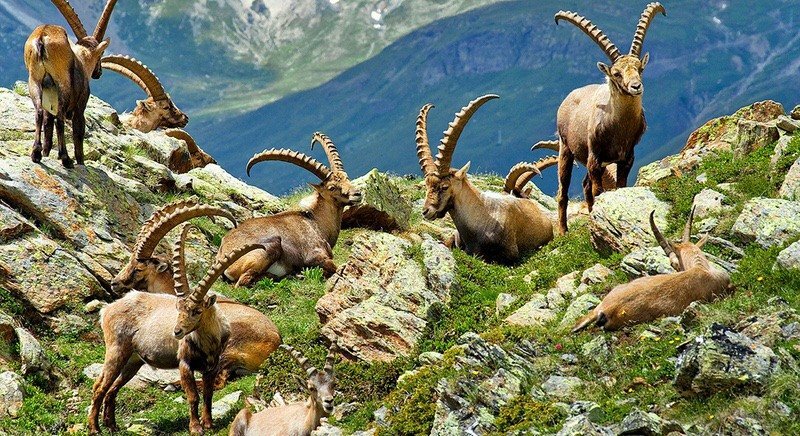 It is not uncommon to spot Ibex as we’re hiking in a nature reserve. 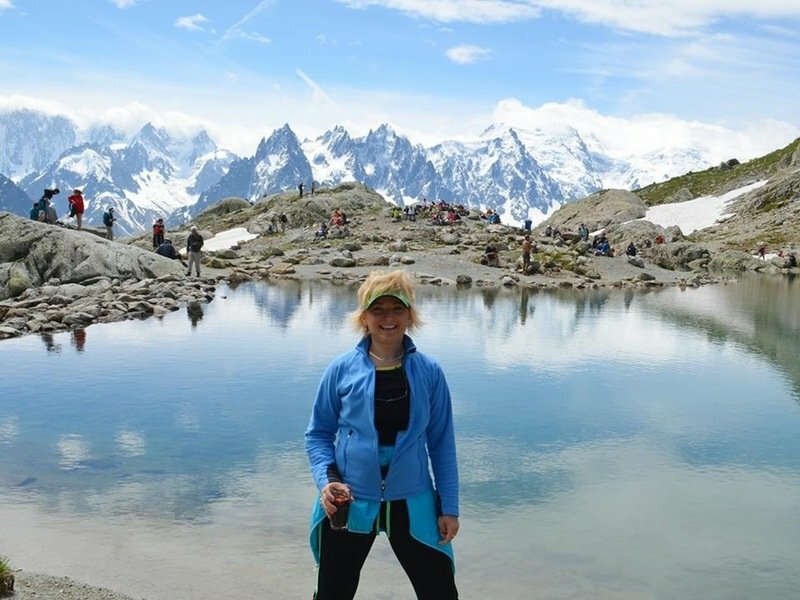 We arrive at the beautiful lac Blanc (the white lake), which is actually a magical blue color. The views from this alpine oasis is amongst the best in the world. After lunch, we hike back to the cable car. It’s important to take care on the descend to the cable car as the views will make us forget to look where we’re walking! Hiking details: approximately 10 km’s with 400 meters ascent. Hiking time 4-5 hours. 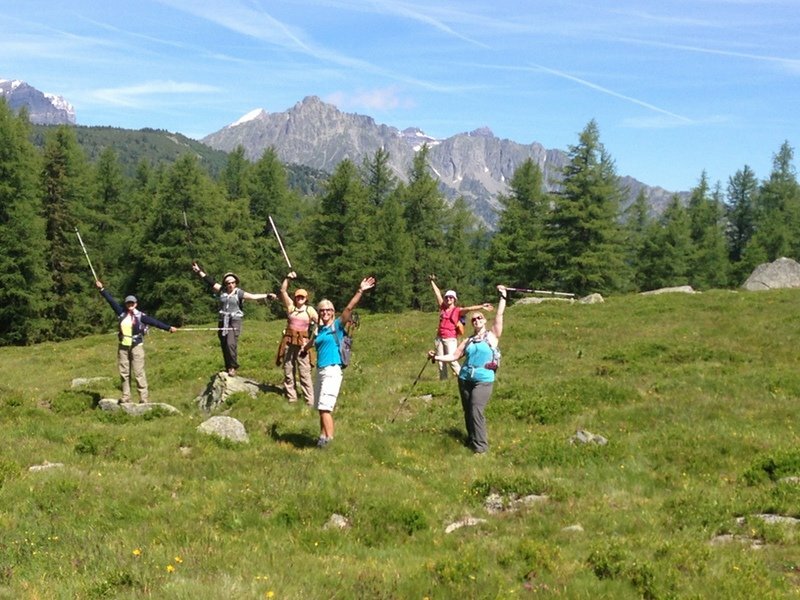 On popular request, we have a free day in Chamonix before leaving on our 3-day ‘expedition’. 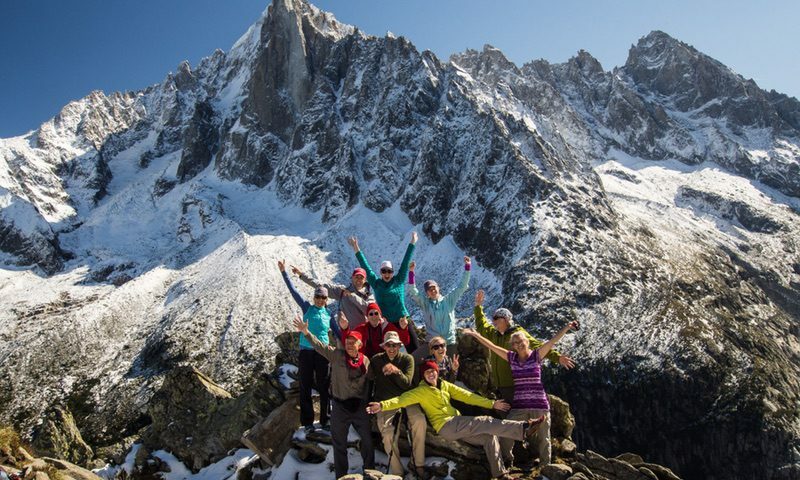 This is an opportunity to experience some of the many other sights and activities that Chamonix has to offer. 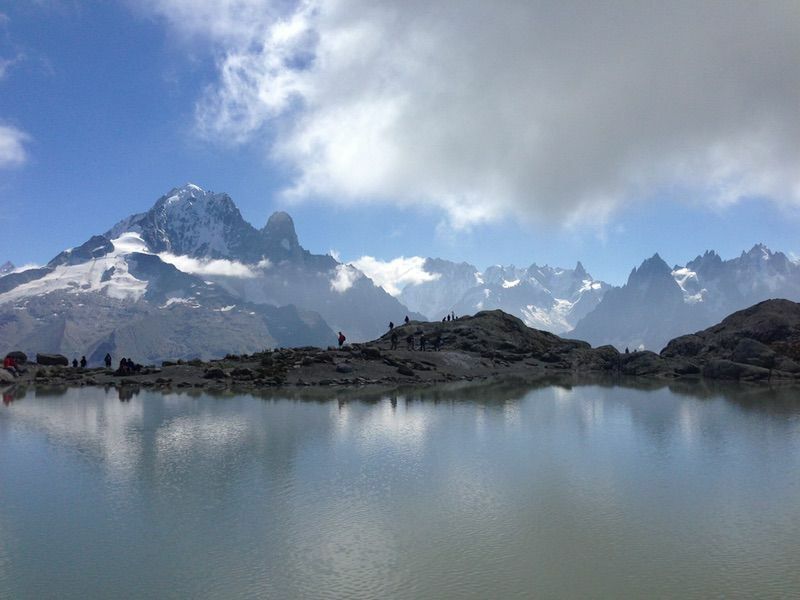 For instance, take the Aiguille du Midi cable car 3 vertical kilometers up to enjoy spectacular high mountain views. Or how about white water rafting, a paraglide ﬂight or mountain biking? 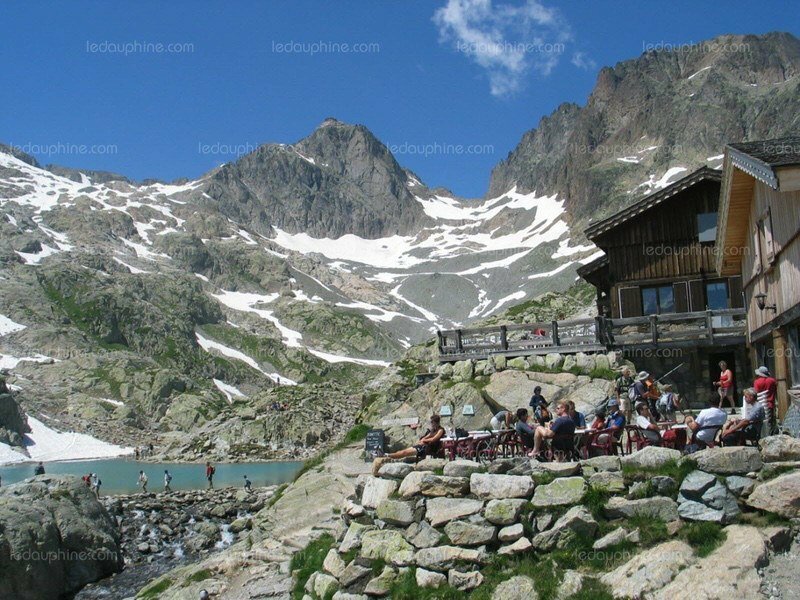 For those preferring slightly more relaxing options, Chamonix has a plethora of cafés, restaurants, museums and shops! 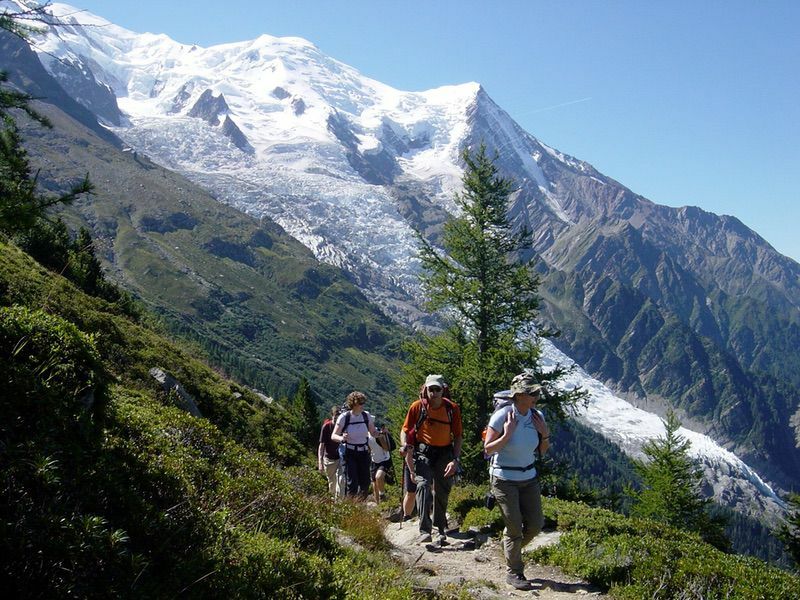 Today, we start our 3-day ‘expedition’ from France to Italy, tracing the famous “Tour du Mont Blanc” (the tour around Mont Blanc). 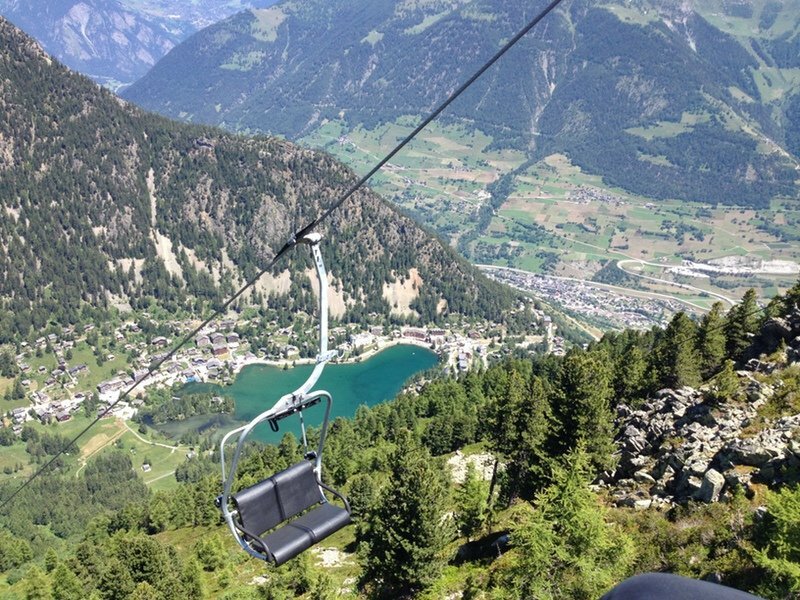 We catch a short transfer to the top of the Chamonix valley, where a cable car saves us from walking up through the ski area. 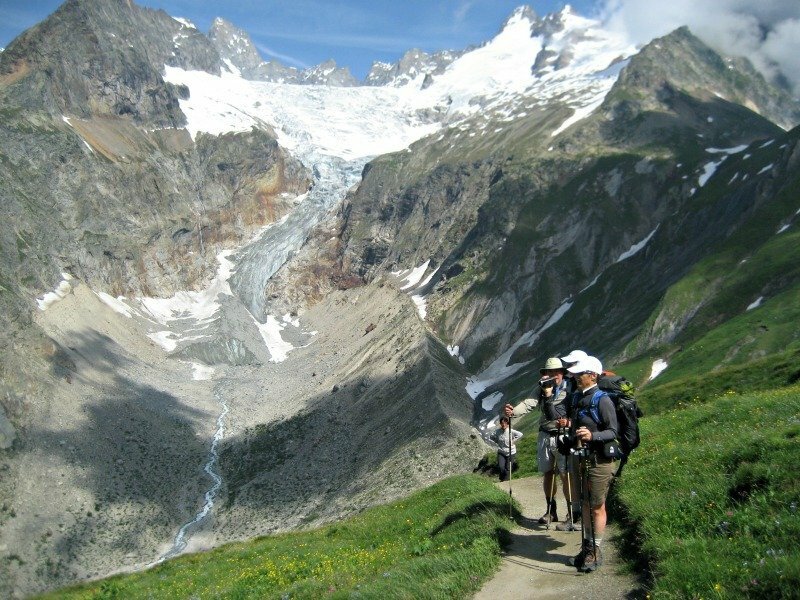 We quickly, leave the ski area and the Chamonix valley behind as we hike over the Balme mountain pass, which forms the border between France and Switzerland. 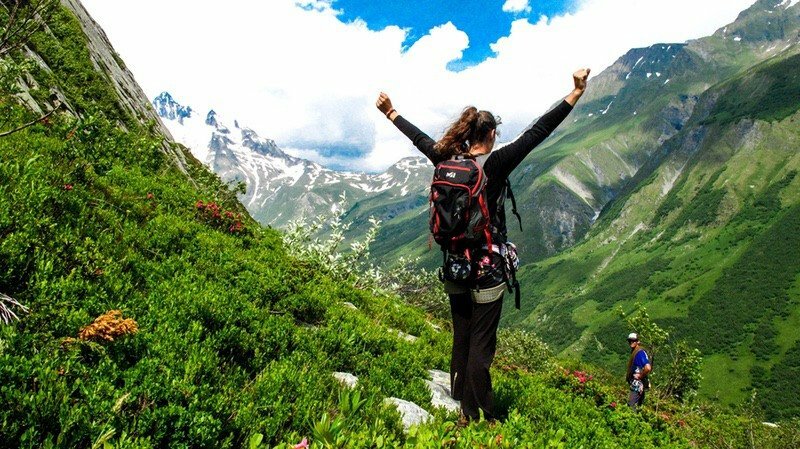 Now in Switzerland, we hike through high mountain pastures amidst stunning alpine scenery and down into the Trient valley. 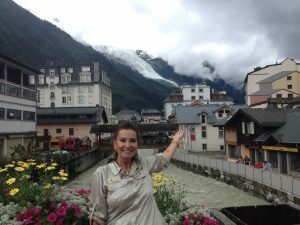 From the village Trient we jump on a bus for a short transfer to the Roman town of Martigny (home of the St Bernard kennel and museum), where we stay the night. 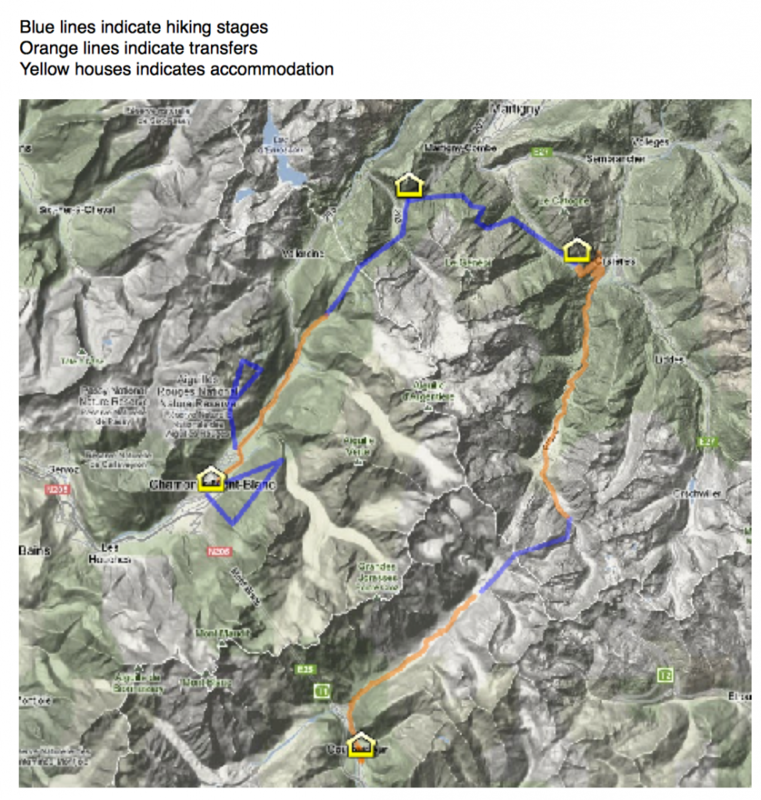 Hiking details: approximately 12 km’s with 400 meters ascent and 600 meters descent. Hiking time 5-6 hours. We are collected at our hotel and taken to the Forclaz mountain pass, where we continue our hike. A narrow trail snakes steadily up through woodland through the wooded hillside and green mountain pastures. 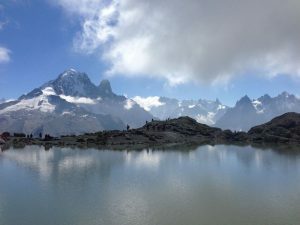 As we come to the top of our ascent, we turn the shoulder of the Mont Blanc chain and are greeted by magniﬁcent views straight up the large Rhone valley surrounded by the peaks of the Swiss Alps. 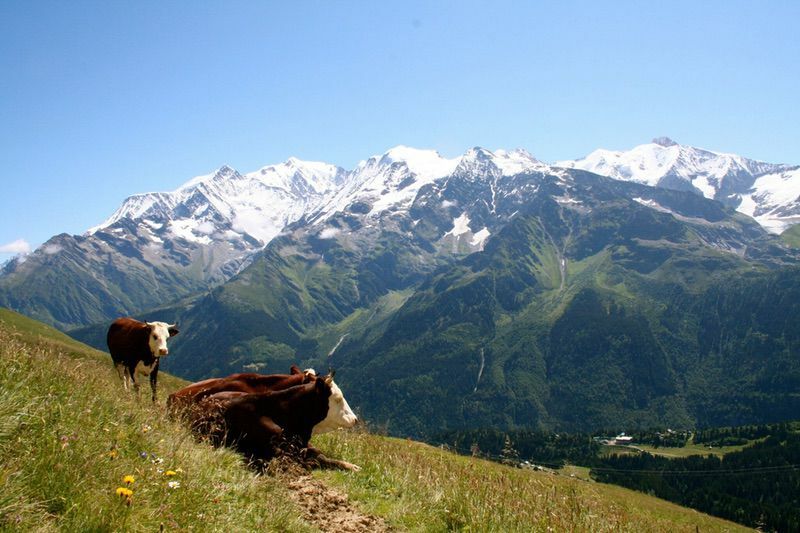 Just below us are the Bovine mountain pastures, which are still in use. The farmers greet us in their rustique guest house where we can enjoy coffee and homemade cakes before commencing our descent. 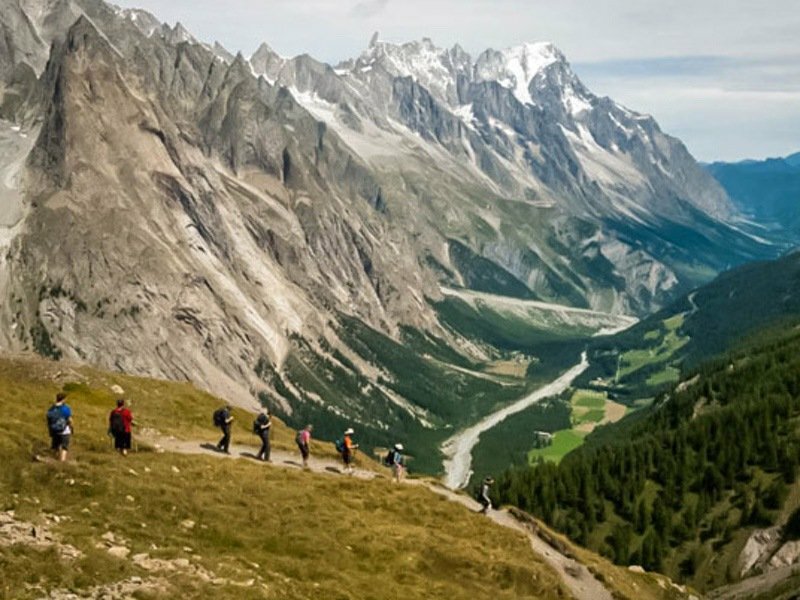 The descent takes us through more woodland, across small streams and, eventually to the small valley that leads us to the traditional mountain village Champex, which is perfectly located on the shores of an alpine lake. 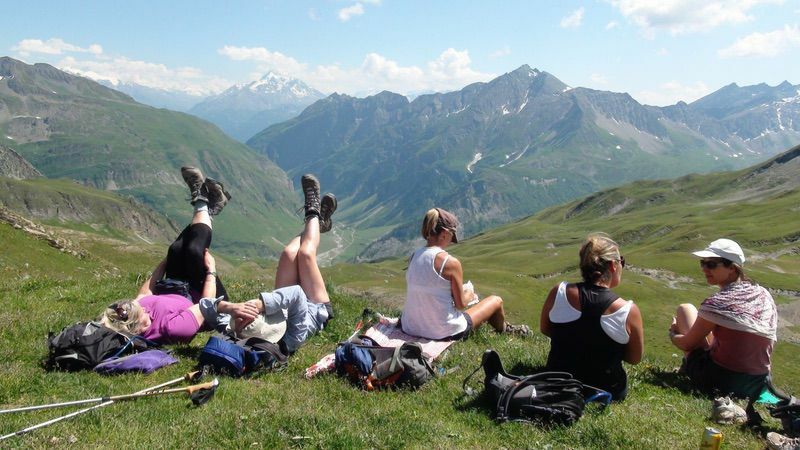 Hiking details: approximately 15 km’s with 600 meters ascent and 800 meters descent. Hiking time 6 hours. 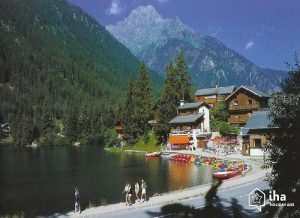 At night, members are free to explore the traditional restaurants in Champex. We start the day with a scenic transfer through Swiss countryside and old farming villages until we reach the top of the Ferret valley. 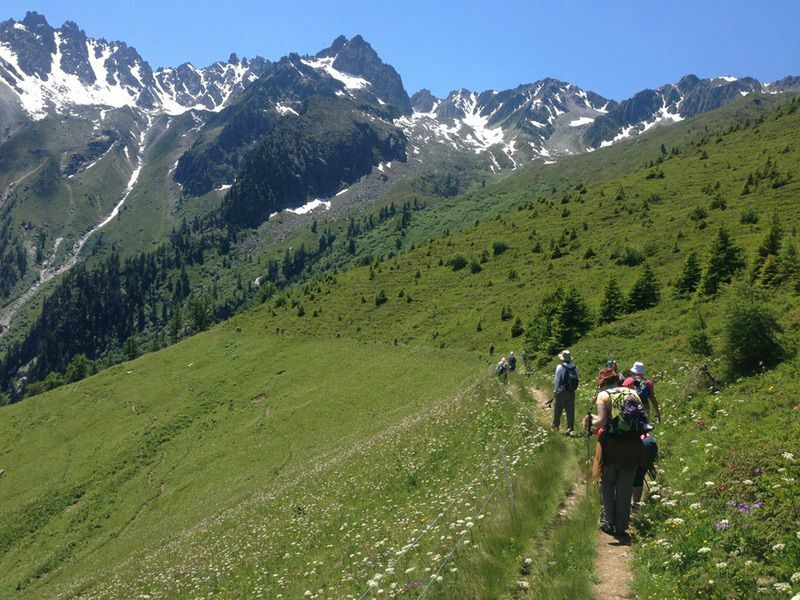 Today, on our last day of hiking, we’re headed over the Grand Ferret pass and down into Italy. 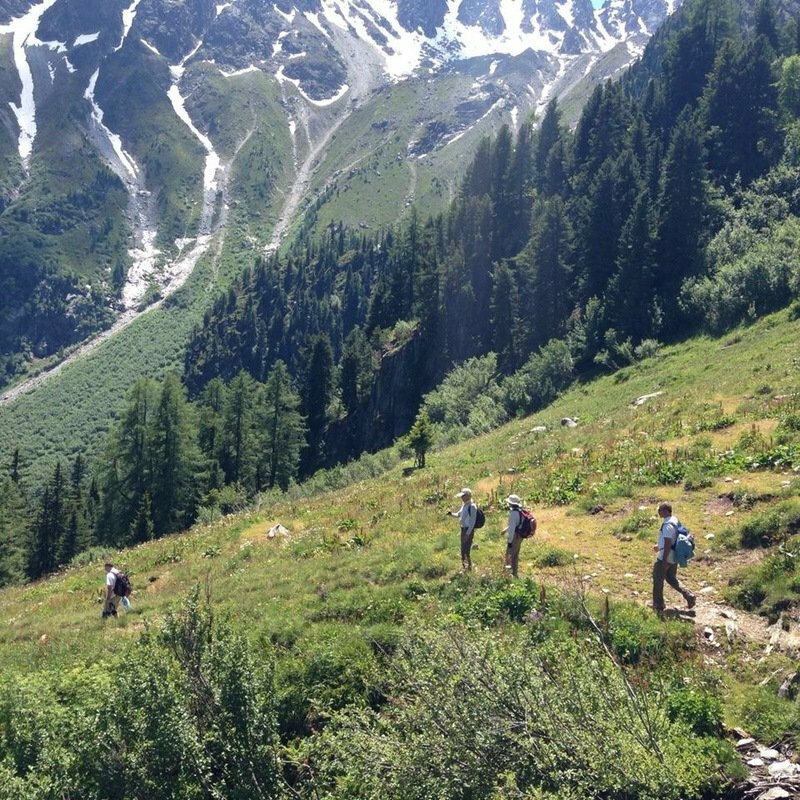 The hike to the mountain pass is straight out of The Sound of Music. On the way, we pass an old dairy farm, where we can stop for refreshments. 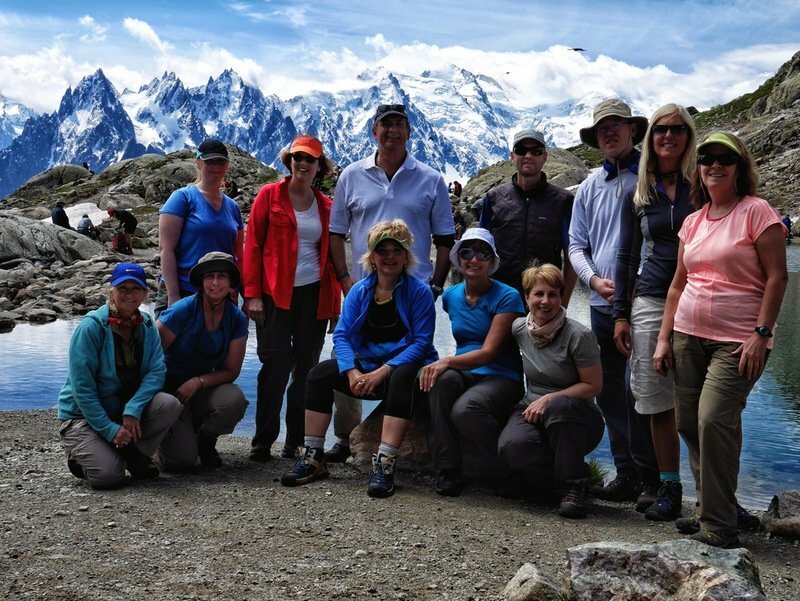 Upon reaching the pass, we’re treated to spectacular views across the Italian Alps and the dramatic Italian side of the Mont Blanc massif. 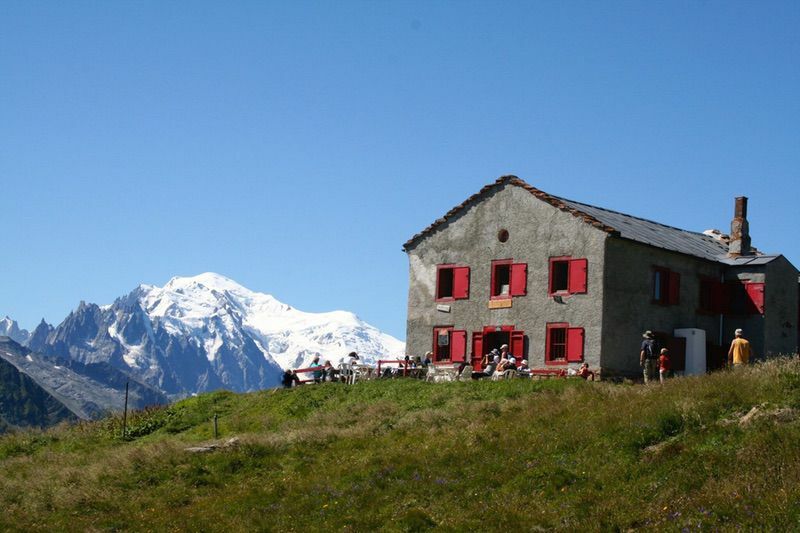 The descent takes us via a modern Italian mountain hut, which serves us the best coffee we’ve had on the trip. 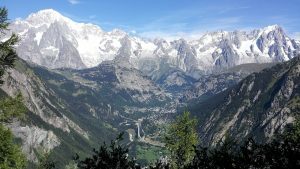 Almost too soon, the ﬁnal descend is over and we jump on our transfer to the charming village of Courmayeur, which is the Italian equivalent of Chamonix. 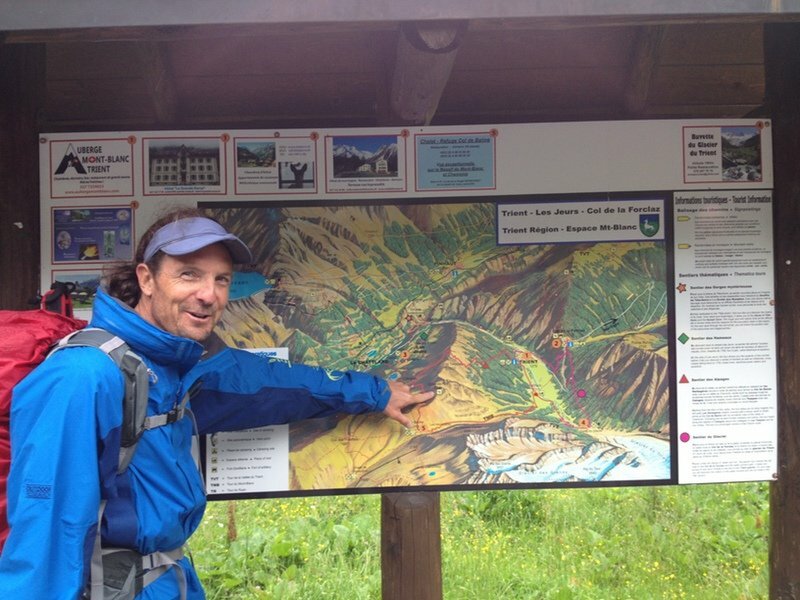 Hiking details: approximately 13 km’s with 800 meters ascent and 800 meters descent. Hiking time 6 hours. At night, we will enjoy a Farewell Dinner together to toast each other over our great accomplishment. After breakfast, the trip is ofﬁcially over. 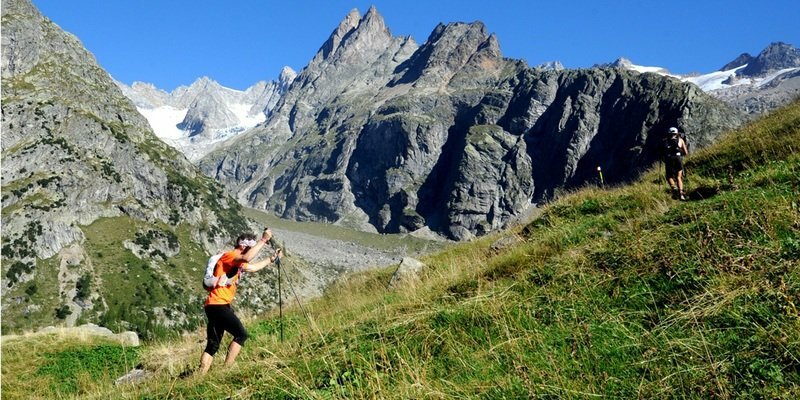 It’s time to check out and leave Mont Blanc and the Alps behind us. 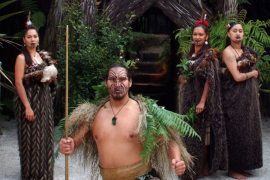 Includes; 7nts accommodations (2 nights deluxe), 7 breakfasts and dinners, group airport transfer arrival and departure, English speaking expert guide and AFS trip leader. All prices are per person twin share. 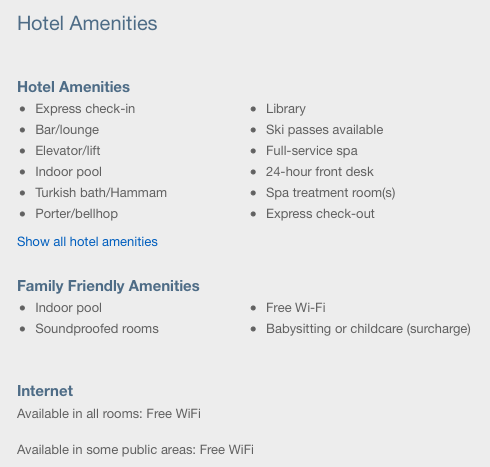 Single rooms limited per group and a single supplement applies. 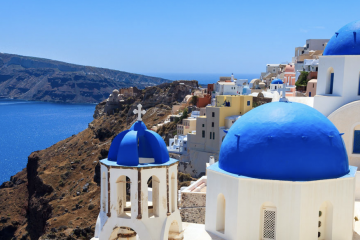 Cost set by hotel/cruiseline and vary considerably. AFS will find you a roommate match. Please review AFS Terms and Conditions as well as Heading Abroad with AFS. Group air – Airlines may add surcharges to offset fuel inflation or taxes. The total ticket cost is not final until we receive your final payment and the group is ticketed. If doing own air, airport transfer may or may not be included depending on your air schedule. Do not buy air until the group air is set or we advise – though unlikely, airlines, times and dates can change! Please review AFS Terms and Conditions as well as Heading Abroad with AFS. 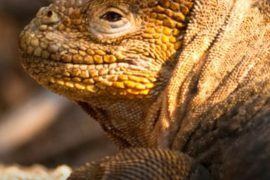 “Galapagos Islands Cruise and Amazon Rainforest Adventure"